Astronomical catalogs provide a starting point for research, as shown in the box to the right. Because the Fermi instruments survey the sky continuously, they are ideally suited to producing both general and specialized catalogs. The Second GBM gamma-ray burst catalog, shown above in Celestial coordinates, contains 953 gamma-ray bursts. Long bursts have duration greater than 2 second; short bursts have duration less than 2 seconds. 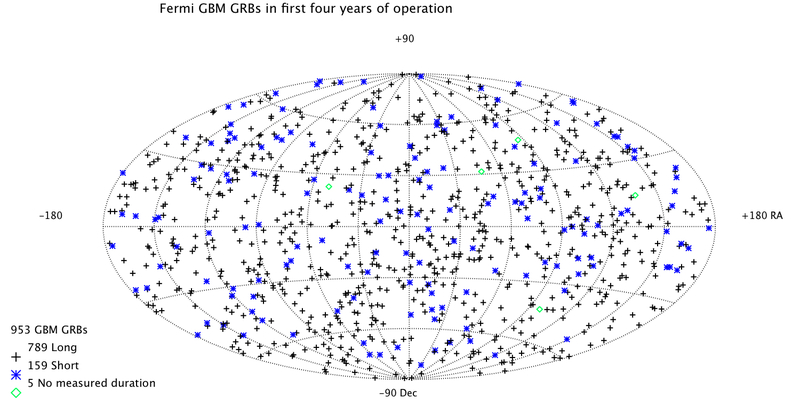 There is also a table of GRBs that have high-energy components detected by the LAT. This table is kept up-to-date by the LAT instrument team. In addition to all-sky catalogs, the instrument teams have performed more specialized analyses, focusing on specific source classes and using careful, systematic treatment of all the class members. As a result there are several publicly-available catalogs that are useful for studies of both individual sources as well as entires source populations. First High-Energy Gamma-Ray Source Catalog: An all-sky catalog tuned to detect only gamma-ray sources that are significant above 10 GeV. 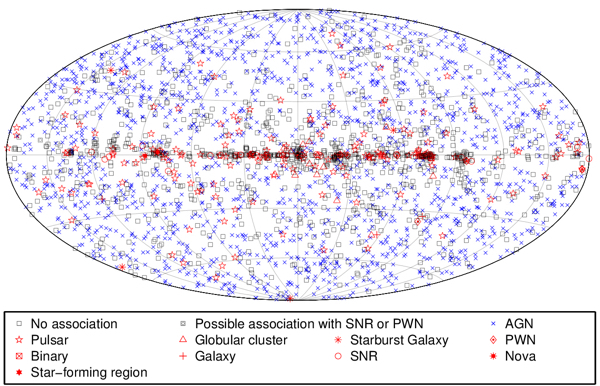 Second High-Energy Gamma-Ray Source Catalog: An all-sky catalog tuned to detect only sources that are significant above 50 GeV. Catalog of Gamma-Ray Pulsars: A catalog that uses timing information for known gamma-ray pulsars to perform analyses of both the ON and OFF pulse data. This provides much better characterization of the pulsar spectral properties, and can be used to search for underlying pulsar wind nebulae. Catalog of Gamma-Ray Supernova Remnants: This catalog reports the result of a systematic gamma-ray analysis performed at the positions of all known supernova remnants.